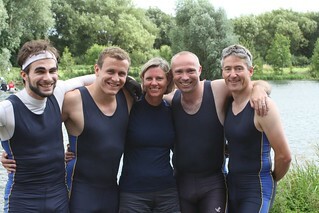 To crown our successful bumps results Chesterton put in an excellent performance at Peterborough regatta. The highlight was our bumps M1 winning IM3 VIII's over 1000m on the Saturday. By all of 0.3 seconds. 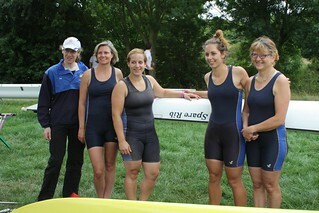 Other crews did well too; the Ladies IV narrowly missed their pots twice. IM3 8+ (M1): Won heat in 3:10.6. Final 1st 3:08.1. Also fastest time of the day. Nov 4+ (M2): Second in heat with 3:45.8. Reached semi finals. W Nov 4+: Won heat by a margin of 5 seconds. In the final, very close 2nd: 4:10.6 against Leeds' 4:09.4. IM3 4+: lost in heat (fastest heat of 4). W Nov 4+: Final, close 2nd (1:55.0, 2.7 secs behind First and Third). Very close finals for the ladies, who narrowly missed out on taking home novice pots. Next time they're yours! Ah, they struggled mightily, but a point at novice is hard to come by. The mighty Chesterton M1 crew, fresh from their 3 up in bumps, came together for one last hurrah before scattering to the winds like thistledown. We even managed some practice outings, one with the full crew - and they felt good. And we had a pre-heat paddle on the Nene. Heat one was against Peterborough and CORC. 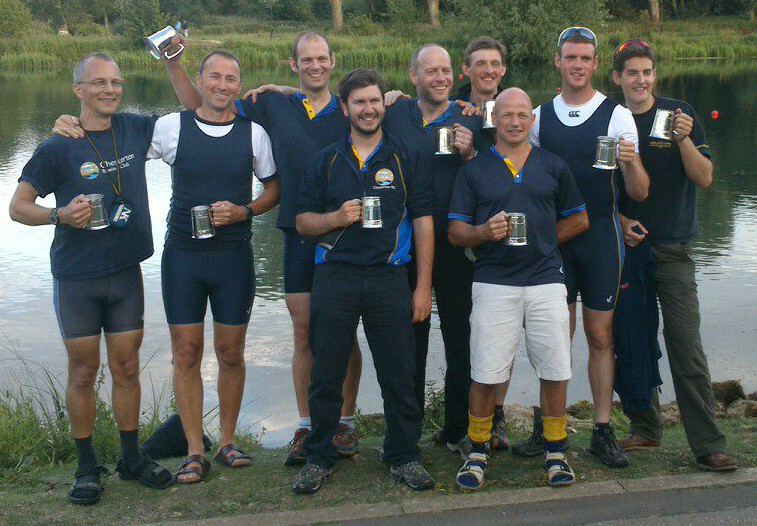 CORC had two IM3 VIII's in the regatta, and as a big club could quite possibly have at least one good crew. As it happened we got the better one but they weren't good enough: we were clearly up by 500m and we kept clear water to the line (yes: I did sneak peeks occasionally; its good for my concentration and anti-nervousness: after 10 strokes it was clear we were pulling ahead of the closest crew, and at 250m we were clearly in the lead). We were also the fastest heat. The heat was just before 2, the final just after 7. The interval was spent dossing in the sunshine, watching races, drinking tea and reading. Now we had three opponents instead of two: CORC from our heat weren't going to touch us, York were second in their heat; so the danger was the Twk-men who (despite their fetching pink-n-purple flowery one-pieces) were only 3 secs behind our heat time; and they looked young and fit and bigger than us mostly. I was sufficiently nervous on the start line to forget to set my GPS off (sorry). We started well; James called us a seat or so up after 250m and I think he was on their 3-man at 500m. But after that they began to pull back oh-so-slowly and we all had to dig deep. James called our push at 750m and we started to hold them; going over the finish line was agonising and the result was too close for anyone to call; we and the Twk-men sat on the water, exhausted, and wondering who had won. Then there were cheers from the bank and! It was us! Woooooooo! A point, and at IM3! I started rowing in 1983 (before Young Wykeham was born, I suspect) so could be considered to have waited 30 years for this. Hmm, thinking of that, the crew mostly divides into young / old based on extent-of-hair-coverage; only the boyish Ralph bucks the Hand of Time. From AS: Awesome moment today. 1000m (3-and-a-bit minutes-ish) rowing race in the final at Peterborough Regatta where there were inches between us at the finish. In the haze of post-race death I heard the oppo's cox say "I don't think we got it...". Aside: the Nov VIII was won in 3:13.0 in a straight final. We beat that by 5 seconds, but they weren't pushed, being 15 secs ahead of their closest competitors. So very likely we'd have won novice (had we been able to enter; James Howard and Andy Southgate already had points) but it would have been close. This illustrates (sez I) how hard it is to get a point: it took the best M1 crew we've had for quite a few years to do it. There's video of our heat here.